I’m on a train to Manchester for some usability research sessions and I’m feeling apprehensive. I’m reflecting on how far we’ve come in the last 6 months in increasing our understanding of access needs. Yet we’re still finding recruiting participants with access needs very tricky and this week’s research is no exception. Over the last six months, colleagues in Home Office Digital's research and design team have doubled their efforts on accessibility testing and design. We’ve increased both our own and our development team’s awareness of digital accessibility; and an agreement’s been made, across Home Office Digital, to include at least one participant with access needs in every round of research. “Access needs leads” are responsible for creating tools that help others, such as Karwai Pun’s poster on the do’s and don’ts of designing for people with autism. They are also responsible for raising awareness and sharing best practice examples. During this research, I’m joining Charlotte Moore and Ben Walker on home visits to users who have mobility issues, which limit their movement and use of a mouse. 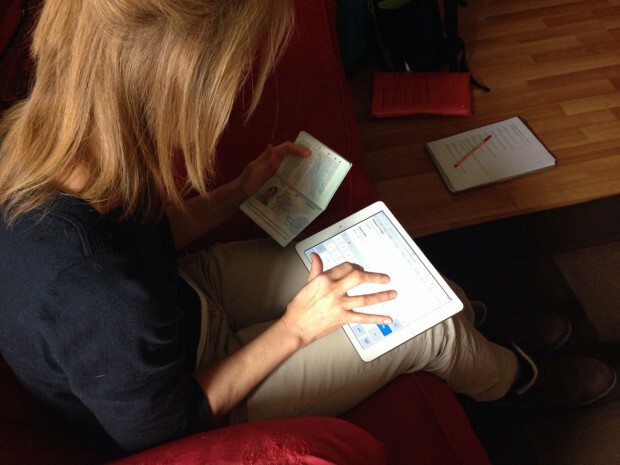 We’ll be testing the new passport renewal service that’s being worked on. I’ve been invited to help because I'm an “access needs lead” for physical disability. It’s a great opportunity. 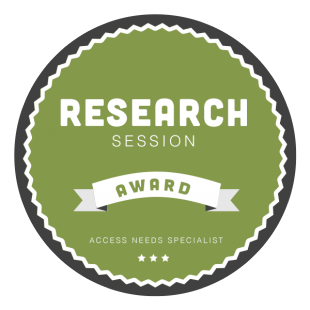 Plus, I really want to earn one of our access needs research stickers. These are given out once we achieve milestones such as research with people with access needs, writing a blog post about accessibility or completing a code review. Recruitment of users with such exacting requirements can be challenging, and in this case our external recruiters have struggled to meet the brief. In simple terms we’re seeking users with low digital skills, who need to renew their passport soon, and also happen to have mobility limitations. My first participant has rheumatoid arthritis, but from the limited notes I’ve read, it seems their condition is mild. It feels perverse somehow to think that ideally we need the condition to be more severe, as it’s only in these instances we are able to thoroughly stress-test the service for accessibility. Recently we’ve been grappling with the recruitment of people with access needs for all our services - both internal and external facing. I’ve a hunch that the way forward is to develop direct routes to participants - through building a network of contacts with trusted intermediaries and disability communities. We need to develop a trust-based way of collaborating with users with different disabilities. We’ve made a start by agreeing with Remploy - an organisation which facilitates employment opportunities for people with disabilities - to pilot research sessions at their offices. They’re keen to better understand their customers’ digital skills and we would like their customers to use our services. We’re also looking internally at the Civil Service, where 8.8% of staff have a declared disability and may be willing to help. Recruiting internally is still proving challenging, despite our efforts outlined above. As Manchester comes into view I’m concluding reading dozens of emails from contacts in other government departments about their accessibility stories. I’m pondering if a solution to our shared challenge is to evolve a centralised list of internal participants with access needs? Follow Emily on Twitter @emilyball53 and don't forget to sign up for email alerts. I really appreciate the layout and content of the dos and don't posters; they seem very clear, but current research has moved on from grouping Dyslexia with visual stress/Meare's Irlen, yet the poster implies that dyslexic people have visual stress as you have used the letter blurring 'symptom'. This is a separate 'condition' therefore dyslexic people may not associate their challenges with the main image, which is a big don't when developing resources. See some research examples below. I'd be interested in hearing why you used the image.